MB BS (Hons); Doctor in Medicine; Master Degree in International Relations; PhD in Law, J.D. (US). Honorary Consul to Romania for the Republic of Equatorial Guinea. http://en.wikipedia.org/wiki/Cesar_Gaviria Representative of Equatorial Guinea at the World summit of Prosecutors and Attorney Generals at Bucharest march 2009 http://www.summitgp2009.ro Justice of Peace in and for New South Wales Australia, Member of the New South Wales Justices Association Aus, Organizer of the Participation of the President of the Republic of Equatorial Guinea in the Francophone Summit of Heads of State in Bucharest 2006. 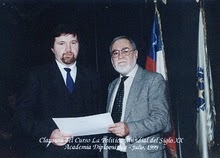 He teaches on line in several universities in Latin America, and East Europe. Member of the International Law Association (UK), Former Member of the International Bar Association (UK),Active member of the Union International des Advocates Paris.